Aided by a Walmart U.S. Manufacturing Innovation Fund grant, NC State professors aim to improve weaving efficiency with new tying-in process. Recent analyses of textile production costs have indicated that the United States is globally competitive in the majority of primary manufacturing processes with exception of weaving1-3. 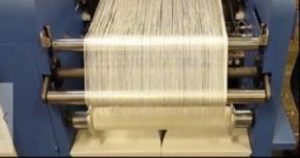 The weaving process is the slowest process in the fabric manufacturing pipeline, and this is due both to the nature of the weaving process, and inherent limitations in the yarns’ tensile and abrasion properties, which can result in yarn breakages during weaving. In an attempt to offset these limitations, a weaving machine must run at its highest speed and efficiency. To overcome the inherent limitations of the weaving process, weavers made major advances in improving the quality of yarns by preparing them to withstand the rigor of weaving, which led to the reduction of short-term stops. Parallel efforts have been conducted by machinery manufacturers that led to the development of high-speed machines. 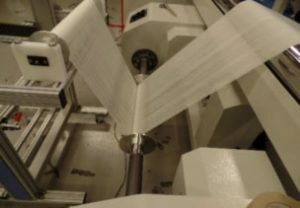 The improvements in yarn preparation and weaving machine speed have reached the limit and other revolutionary ways to improve efficiency of the process are sorely needed. Two long-term stops in weaving remained unchallenged: Style change, which is conducted when a warp beam runs out and new fabric with different specifications is required; and tying-in, which is performed when the warp beam runs out and the same fabric needs to be continued. Style change requires four to eight hours to complete while tying-in needs 30 to 120 minutes, excluding the time preparation prior to tying-in and loom beam change and passing the knots after tying-in, depending on warp width, warp density, yarn type, and tying-in machine type. This sort of long-term stop significantly reduces the efficiency of high-speed weaving machines. More than 50 percent of world fiber production is converted to woven fabrics for applications including apparel, home, and technical textiles. While modern weaving machines operates at high-speed, the weaving process remains the slowest process in the entire production pipeline. This is due to the nature of the weaving process and the inherent warp and weft yarns’ properties, with finite tensile strength and abrasion resistance, and as a result yarns can break during weaving. In the event of a yarn break, the process is automatically stopped and a manual repair by the operator is then made. A weaving machine has to perform a series of sequential motions to interlace a weft yarn with numerous warp yarns every weaving cycle. 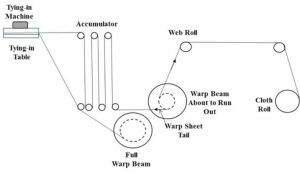 A finite length of warp sheet is supplied on a warp beam behind the loom that will eventually runs out and this requires stopping the process to replace the run out beam with a full beam. Because the weaving process is the bottleneck in the production pipeline, weaving speed and efficiency must be maximized. Machine manufacturers have succeeded in developing high-speed machines through the development of better and more powerful motors, lighter and stronger machine parts, and separate drives for weaving motions. 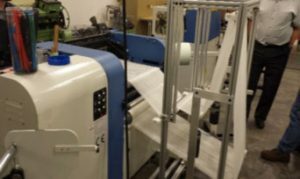 In fact, today’s weaving machines can run faster if the warp and weft yarns can handle the complex stresses that arise from the high speed combined with the nature of the process. To increase machine assignment per operator, reduce downtime, and enhance versatility and quality, weaving machine manufacturers have developed innovative electronic-based and control technologies that include: automatic weft repair to reduce downtime; variable weaving speed to preprogram speed for each weft yarns based on their strength to avoid breaks; automatic weave/pattern change to eliminate stopping to change weave if same warp is used; start mark prevention; and on loom inspection4-6. On the other hand, research and development in yarn preparation for weaving — spinning, winding, warping, and sizing — has led to better prepared yarns that can withstand the rigor of weaving process and minimize yarn breaks during weaving and hence increase weaving efficiency7-12. Additionally, there has been significant work on the role of spinning system and processing parameters on the properties of yarn which can be correlated with their subsequent weaving performance13-15. Two long-term causes of weaving stops remained unchallenged. These are style change — which is conducted when warp beam runs out and new fabric with different specifications is required — and tying-in — which is performed when the warp beam runs out and the same fabric to be continued. Style change requires four to eight hours to complete, while tying-in needs 30 to 120 minutes, excluding the time preparation prior to tying-in and loom beam change and passing the knots after tying-in, depending on warp width, warp density, yarn type, and typing machine type, which is premium for high-speed weaving. Tying-in is conducted for numerous fabric types such as shirting, sheeting and pillow, denim, air bags, and almost all jacquard fabrics. Each weaving room has several tying-in machines to conduct tying-in after loom beams run out. Previous research work focused on improving tying-in machines to increase the degree of automation, expand their applications, and increase knotting speed. At the ITMA exhibitions of 2003, 2007, 2011, and 2015, major tying-in machine manufacturers exhibited latest automatic tying-in technologies. More details on advances in tying-in can be found elsewhere4-6&16. None of the previous research and development efforts dealt with eliminating the long-term stop of the weaving process while tying-in is being performed. The Walmart Foundation and U.S. Conference of Mayors call for proposals in July 2015 for applied research from the Walmart U.S. Manufacturing Innovation Fund included weaving as one of the thrust areas of research. This motivated the authors to successfully propose an innovative, revolutionary research approach to eliminate the long-term stop practiced currently and to allow the weaving process to continue without stopping while the tying-in process is being conducted. The proposed work targeted the development of portable mechanisms that could work with any current automatic tying-in machine. This project deals with eliminating the need for stopping the weaving process in order to conduct tying-in. Currently, when the warp beam runs out, the operator stops the process, and an automatic tying-in machine and its table are brought to the loom along with a full warp beam. Setting time, which is conducted by tying-in operators, is required before the automatic tying-in of each warp yarn from the run out warp beam to its corresponding yarn of the full warp beam. 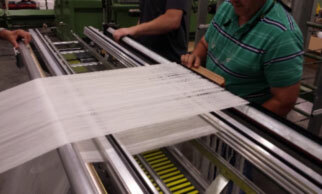 After tying-in, the empty warp beam is taken out of the loom and replaced by a full warp beam. 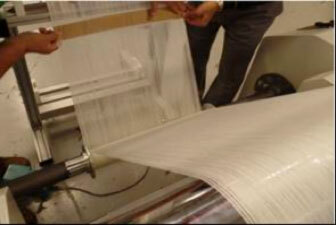 The knots are then passed through different parts of the weaving machines, namely drop wires, heddle wires, and reed. Then the weaving process resumes after many hours of lost production. The recognized advantages of the project is to increase weaving efficiency/productivity and reduce the cost of woven products. This will afford U.S. woven fabric manufacturers a competitive advantage and potentially increase the number of jobs in weaving and its allied industries, which is in line with the target of the Walmart U.S. Manufacturing Innovation Fund. The problem to be addressed is that in order to provide new warp sheet, the weaving machine needs to be stopped, to allow for knotting of yarns from the new warp sheet to the end of the run out warp sheet, and this essentially renders weaving as a batch process. 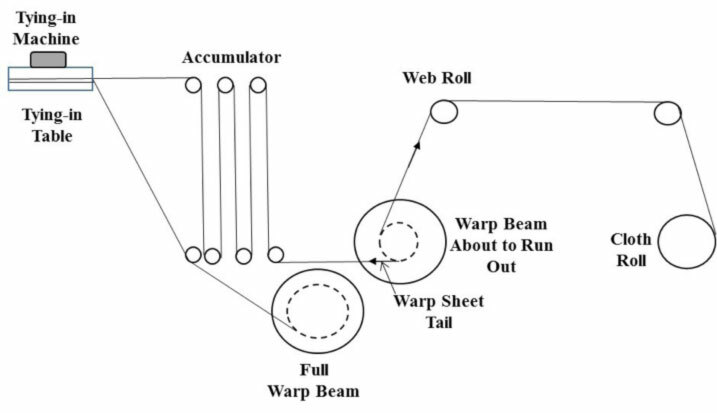 To continue weaving during the tying-in process and achieve the objectives of the project, two developments are required: (1) Develop a loom beam winding procedure, at the sizing or warping process, to create a warp beam with tail that will be available for tying-in before warp beam runs out, and (2) Develop a warp sheet accumulator to store the warp tail while the weaving machine is forming the fabric from the main warp sheet. 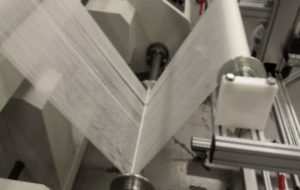 The warp tail length, which depends on the weaving speed and pick density — or fabric take up speed — must be sufficient to allow time for the tying-in and its associated procedures. A schematic of the concept of non-stop tying-in process is shown in Figure 1. The figure shows as the warp beam is running out, the tail will unwind and become available for connecting to yarn on the replacement beam. As it can be seen from the figure, the warp sheet tail is fed out through the accumulator’s rollers into the tying-in table. The sheet of the full warp beam is also fed into the tying-in table. 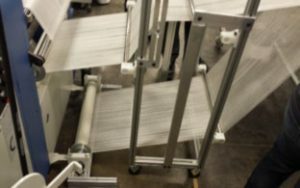 The yarns of the two warp sheets will be joined, and any excess warp sheet length will be accommodated by the spread of the moveable rollers of the accumulator, which is also part of a control system to ensure uniform tension. When the process is completed, the full warp beam will replace the empty warp beam. Then both tying-in machine and the accumulator are moved out to storage or to the next weaving machine for another tying-in procedure. To design and build non-stop equipment and procedures, it was decided to conduct tying-in time study to capture the time of every task performed during the entire tying-in process, including preparation for tying-in, tying-in, and post tying-in tasks. This will enable the determination of tasks that could be streamlined during the formation of tailed warp beam and non-stop tying-in process as well as design the equipment for ergonomic purpose, which will lead to overall improvement in weaving efficiency. The tying-in time study was conducted at the Weaving Lab at North Carolina State University’s (NC State’s) College of Textiles, on a G6200 rapier loom weaving 60-inch-wide fabric with 3,120 warp yarns (or ends/inch = 53.5). The warp yarn was 2-ply, spun. The entire time from loom beam run out to the recommencement of weaving with the new warp is 196 minutes. It took a team of three to conduct all procedures, however, most of the time one operator conducted the tasks. To precisely get the time for each task, a video capturing system was used. The video was streamed to capture the beginning and end of each event. The Table 1 shows beginning, end, and time of each task. This time study revealed that there are numerous tasks required before and after the actual tying-in task. The tying-in process (task 22) took 77 minutes to complete. The preparation for the tying-in tasks (1-21) took 98 minutes to perform while the tasks (23-27) conducted after tying-in took 21 minutes. It should be pointed out that the number of ends tied-in in this case are low compared to high dense warp. The warp density of such high dense warps could reach 300 ends/inch or more for applications such as high thread count bed sheets, backed fabrics, and double cloth. With such high number of warp yarns, it is expected that the stop time to conduct tying-in process and its preparation will be much higher than the case studied here. A proprietary passive warp storage (accumulator) as a first prototype, was designed and built at NC State’s machine shop. It was designed to work with 20-inch-wide CCI sample loom available at the College of Textiles. 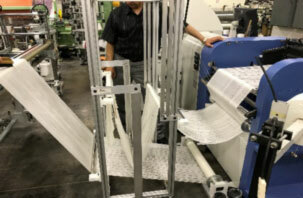 The word passive here indicates that there is no warp sheet tension control, rather the warp sheet tension is controlled by rollers and dead weights. This is a simple flexible prototype to be used for developing the final, more sophisticated solution. 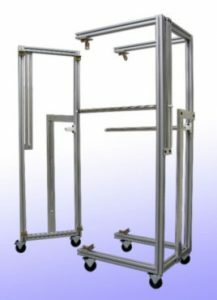 The purpose of the first prototype is to study the operator/machine interaction, improve ergonomic and reduce process time and lead to design of an active prototype with tension control. 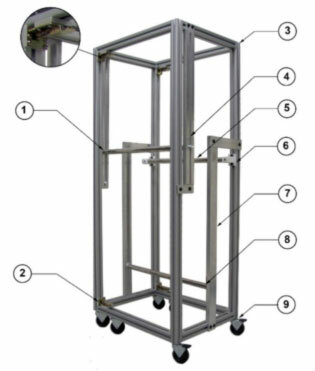 Figure 2 shows the warp accumulator disassembled and assembled. The system was designed in two parts to allow disengaging the system from the warp sheet after completing the tying-in process using four quick release clamps for quick disassembling/assembling. The figure shows the parts of the warp accumulator. The number between parentheses indicates the quantity of each part. A warp beam support, which is needed to work with warping machine to form wrap beam with tail, was also designed and built. This equipment supports a warp beam that has the tail warp sheet with required length. The beam is termed tail beam. The support is a frame with two bearings to allow unwinding the tail to form the final beam with tail using the warper. This is also a passive system. A more sophisticated system will be built that will have a tension control and positive feed. The non-stop tying-in process requires two steps. The first step is to form warp beam with tail and the second step is to conduct the tying-in process and its associated tasks while the weaving machine is running. A CCI Lutan V3.6, equipped with rotary creel, warper was used to form a tail beam and final warp beam with tail. The warp width was 20 inches with 50 ends/inch for a total of 1,000 ends and a yarn count of 42/2. The procedures of formation of loom beam with tail are shown in Figure 3. After the warp was completed on the pattern drum, the tail beam was wound (See Figure 3a). The tail length was about 7 yards — 1 yard from point of tail take off from the warp beam on loom, 4 yards in the accumulator, and 2 yards from the accumulator to the tying-in table. The tail beam was fixed on the beam support (See top right in Figure 3b). The warp beam was placed in the two bearings as seen in Figure 3b. The warp beam is formed from a folded warp sheet; the tail and the main sheet on the drum form a fold. The fold is achieved by a spring rod pushed down against the warp sheet and supported by the warp beam flanges. After securing the spring rod, loom beam winding starts (See Figure 3c). The loom beam is formed from the tail, from the tail beam and the warp sheet from the pattern drum till the end of the tail (See Figure 3d). The end of the tail is secured with tape in order to keep the warp yarn spread out and in order to reduce handling and brushing in preparation for the tying-in. The winding of loom beam with tail continues (See Figure 3e) form the warp sheet on the pattern drum till the entire warp is transferred. 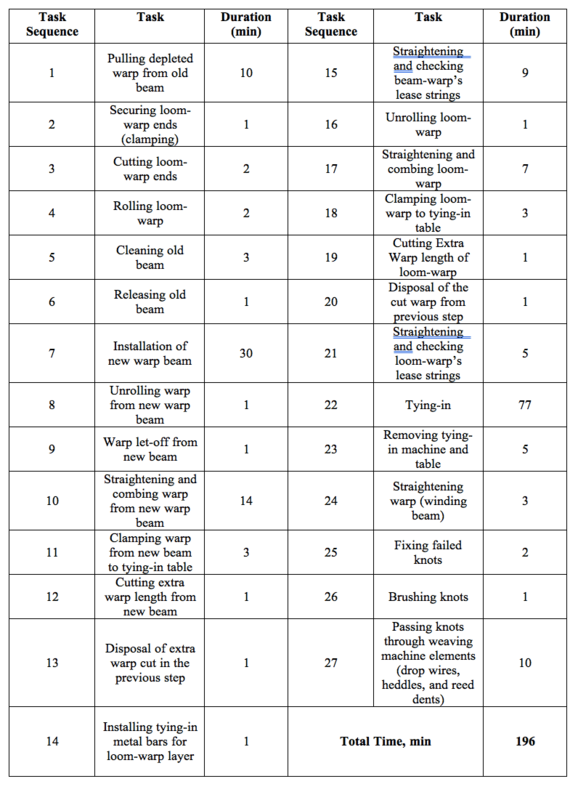 Once the end of the tail merges out of the loom beam during weaving, the procedures of non-stop tying-in process start (See Figure 4a). The new full warp beam, the accumulator, and the tying-in table are brought and stationed behind the weaving machine as it can be seen in Figure 4a. The new warp sheet is pulled and guided to the tying-in table where it is brushed and clamped to the table. The tail warp sheet is taken and threaded through the accumulator rollers (See Figure 4b) and then clamped to the tying-in table above the warp sheet of the new beam. 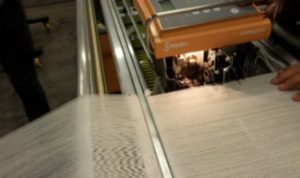 The two warp sheets are brushed and warp yarns are straightened in preparation of tying-in or knotting (See Figure 4c). The tying-in machine is brought and engaged to the rails and tying-in starts (See Figure 4d). The above steps are conducted while the weaving machine is running from the main warp sheet of the loom beam and the tail is being stored in the accumulator. When the main warp sheet runs out, the spring rod will be uncovered and removed. At this moment, the accumulator will take any slackness out as a result of removing the spring rod. At this stage, the accumulator feeds the weaving machine from the stored warp sheet (tail) as it is shown in Figure 4e. The weaving machine will be stopped after 10 minutes during this trial to replace the empty warp beam with the full warp beam. Then the weaving process resumes. 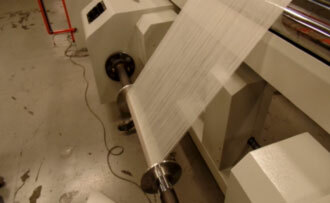 The accumulator supplies the loom with the warp sheet from the tail until it is depleted. The accumulator is disassembled and then taken away to storage or to the next tying-in if needed. The new loom beam supplies the warp to the loom after stopping the loom for short period to pass the knots through the heddle wires’ eyes and reed dents. It should be noted here that the stop time to install the new full beam can be eliminated by having a nip incorporated with the accumulator or beam support to keep the sheet tension under control. Beside the elimination of stop time and loss of production, additional advantages were realized during conducting the trial. These include elimination of tasks shown in Table 1, reduction of warp waste, and elimination of the need to check the end of warp beam. The tail emerging from the warp beam is obvious and it is possible to install an optical sensor to detect the tail appearance. This trial marks a historical technological innovation and proved the concept of the non-stop tying-in process and paves the road for commercialization of the process for any type of weaving machine. 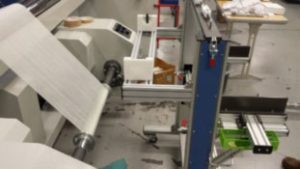 The authors currently are collaborating with a N.C.-based weaving company and planning for full-scale trials at its facility. A full-scale accumulator and tail beam support are being sourced to be built by a machine manufacturer. Seyam, A.M., ITMA 2003: Weaving Technology, Textile World, 34-39, February 2004. Seyam, A.M., Weaving and Weaving Preparation at ITMA 2007, Textile World, 42-47, January/February 2008. Seyam, A.M., Weaving and Weaving Preparation, ITMA 2011, Textile World, 34-37, January/February 2012. Namboodri, C.G., Foam Sizing and Blend Yarns: Slashing Trials, Textile Research Journal, Vol. 56, No. 2, 87-92, 1986. Hari, P.K. and Behera, B.K., High Pressure Squeezing in Sizing: Performance of Cotton Yarns, Textile Research Journal, Vol. 59, No. 10, 597-600, 1989. Abrasion Studies of Sized Cotton Yarns Before and After Weaving, Textile Research Journal, Vol. 59, No. 10, 622-629, 1989. Seyam, A.M., Weaving and Weaving Preparation at ITMA 2003, JTATM, NCSU, Vol. 3, Issue 3, 2003. Thomas, H.L. and Zeiba, J.M., Size Lubrication Methods for Air-Jet and Ring-Spun Yarns, the Journal of Cotton Science, Vol 4, No. 2, 112-123, 2000. Mirzaei, M., Gharehagaji, and Zarrebini, M., A new method of Yarn Hairiness Reduction by Air Suction during Carding, Textile Research Journal, Vol. 80, No. 20, 2128-2138, 2012. Bryan E., Oxenham W., “The Abrasion Characteristics of Ring-Spun and Open-End Yarns”, Proceedings of 12th EFS Research Forum, pp. 1-13, [CD-ROM, Cotton Incorporated]. Basal G. & Oxenham W., “Comparison of Properties and Structure of Compact and Conventional Spun Yarns”, Textile Research Journal, Vol. 76, No. 7, pp 567- 575, 2006. Erdumlu N., Ozipek B., Oxenham W., “Vortex Spinning Technology”, Textile Progress, Vol. 44, No. 3-4, (2012), pp. 141-174. Seyam, A.M., ITMA 2015 Technology: Weaving, Textile World 38-42, May/June 2016. Editor’s Note: This material is based upon work supported by U.S. Manufacturing Innovation Fund Grant No. 2016-1006. The authors would like to extend their thanks to Dr. Mohamed Midani for the help with the tying-in time study and drawing of the accumulator.